Martial Arts program for youth ages 5-6 years old. A Korean martial art with a heavy emphasis on kicks. Basic and advanced forms, strikes, kicks, weapon disarming, and pressure point. Oriental weaponry course will allow you to learn proper technique and use of weapons. Weapons are made from wood or foam and are available for purchase through Master Rachel. This self defense course will meet 5 times in the summer 1 session and will focus on anatomical targeting systems. Child must be able to stand still and follow instructions. Master Marland Rachel will determine after the 1st trial class if the student will be mature enough to continue in the class. Students should come to class in comfy stretchy clothing and bare feet. Once attending class your instructor will provide an order form to purchase a uniform. ORDERS PLACED at the end of week 2. Stop by the courtesy desk or click here to register/pay for session then come to class! Teacher at Kewanee High School. Officer with Kewanee Police Department. Certified self-defense Instructor. Master rank 5th dan black belt in TaeKwonDo with Stoner’s Martial Arts, Kyumson Martial Arts Academy & Breakout Christian self-defense. Master rank 4th dan black belt in Jiu-Jitsu at Stoner’s Martial Arts. 2nd dan black belt in hapkido with International Combat Hapkido Federation. 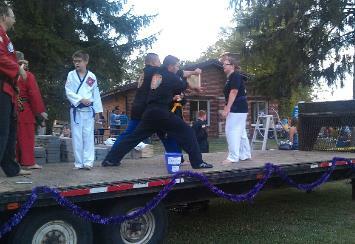 Black belt in oriental weapons through Breakout Christian self-defense. Instructor Certified for Military Combatives through the MCA a branch of ICHF. Founder of Young-ui Jeongsin (Spirit of the Dragon) Martial Arts.